SHANGHAI (Reuters) - Bearing rice burgers and lotus roots, an army of Chinese fast food firms is cooking up a challenge to McDonald's Corp and Yum Brands Inc, tempting cost-conscious diners with healthy, homegrown fare and causing a drag on growth for the U.S. chains in the country's $174 billion (107 billion pounds) fast food market. 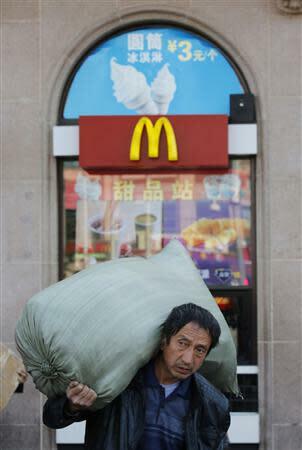 McDonald's said last week it was thinking of slowing expansion in China as diners are tempted by local rivals. 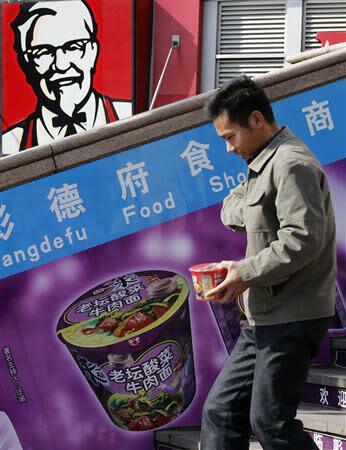 KFC-parent Yum warned this month economic weakness in China would drag on a recovery in sales dented by a food safety scare at the end of last year. Meanwhile, local firms such as chicken chain Dicos, Country Style Cooking, and Kung Fu Catering have been nibbling away at the dominance of their U.S. rivals. "I'm a bit sick of Western fast food. There's too much oil, and you hear things like chickens having six legs," said student Tang Mei, 25, as she dined at Taiwanese-owned fast food outlet Dicos. "Health concerns have really made people worried." McDonald's and Yum are still the largest fast food chains in China but, despite heavy investment, McDonald's has seen its market share by value stagnate at 2.3 percent since 2007, according to data from market research firm Euromonitor. Yum, which held 6.5 percent last year, is up slightly over the same period, but has seen same-store sales hit after a food scare last year and a local outbreak of avian flu. Yum has 5,600 KFC and Pizza Hut China stores, to McDonald's has 1,800 local outlets. Brands like Ting Hsin International-owned Dicos, the third largest fast food brand in China, have taken note. The firm, which plans to triple its store count to around 3,700 by 2020, says it aims to "break the traditional Western fast food mould". While conceived in the image of KFC - its name is a play on "Texas" in Chinese - Dicos now also pushes its Chinese roots. Its website displays an ornate blue ceramic bowl steaming with traditional herbal tea, while rice cake burgers and soybean milk flank the chain's more traditional nuggets and crispy wings. "After all, since ancient times rice has been the key staple of the Chinese people," explained Zhuang Weitang, a spokesman for Ting Hsin International, adding the brand was planning to up its drive towards healthier, Chinese-style cooking. "It's the mix (of traditional chicken) with new, health-focused Chinese specialities that has helped us create a niche in the fiercely-competitive Chinese fast-food market." In a slowing economy, many consumers are trading down to cheaper alternatives or simply dining at home, said analysts, which has contributed to the growth rate in the wider fast food market halving over the last 5 years to 8 percent this year. Lunch at Dicos costs less than 17 yuan (1.7 pounds) compared with a similar offering from KFC, which costs 25 yuan, according to Mintel. "Local establishments generally also do a better job catering to local tastes," said Karla Wang, associate research director at market research firm TNS China. "These familiar 'comfort foods' often go a long way in soothing frazzled consumers during times of uncertainty." Diners have even started to question international chains' quality, traditionally a strong point after scandals ranging from the use of recycled "gutter oil" for cooking to industrial chemical-laced milk made consumers wary of local products. But a number of scares over the last year, including reports that some chicken purchased by KFC and McDonald's had been fed excess antibiotics, seems to have altered consumer views. Only one-in-four Chinese thought Western fast food was healthier and better quality than Chinese alternatives, said a recent report from research firm Mintel. McDonald's and Yum have taken note. "We address food quality and food safety in all aspects of our communication; most recently, we launched a Moms' Trust campaign... and we will be doing more in this area," said Jessica Lee, a Shanghai-based spokeswoman for McDonald's. Yum officials were not immediately available for comment. 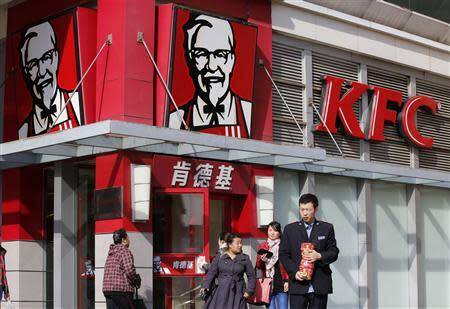 The company has trimmed its local supply chain and plans to launch a new China quality assurance campaign in November that will feature KFC employees, suppliers and poultry farmers. "We still have work to do, but we know we are doing the right things to regain consumer trust and we remain confident that our best days for KFC in China are yet to come," Chief Executive David Novak said in an analysts call on October 9. As trust of domestic brands grows, diners are being increasingly drawn to local dishes, perceived as healthier due to a wider variety of ingredients, while there is mounting interest in traditional Chinese food and dining culture. Last year a documentary called "A Bite of China" aired on local television drawing more than 100 million viewers, making it the most successful documentary in China since the 1990s. Chinese heritage has become a key selling point. Kung Fu Catering, which sports an emblem of martial artist Bruce Lee, underscores its local credentials by playing up the natural ingredients for its Chinese-style food against backgrounds of Chinese mountains, wispy clouds and bamboo. Others such as Country Style Cooking, CNHLS and Gll Wonton, owned by Shanghai Shihao Catering, all offer fast food with a Chinese flavour. Though some way behind Yum and McDonald's in terms of size, all are taking market share from the huge independent sector of single shops and stalls. Local brands also perform strongly in regions away from the saturated east coast market, catering to local tastes in areas seen as the China's next drivers for growth. "Country Style Cooking is really strong in western China, while Kung Fu Catering is from Shenzhen and does well with more rice-based Chinese set meals, which fit the trend towards less oily and healthier food," said James Roy, Shanghai-based senior analyst at China Market Research Group. China's influential netizens also suggest the U.S. firms are struggling to remain the flavour of the month. Chatter about the two brands on China's Twitter-like Weibo fell to an almost two-year low in September, according to analysis by Reuters. As one microblogger wrote: "I won't choose anything but Chinese fast food. We've got crab meat dumplings to Hunan-style cooking, fragrant Xinjiang breads and lamb kebabs... What do brands like Pizza Hut and McDonald's possibly have to offer?"